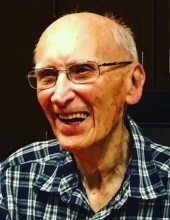 James F. Schlecht age 100, passed away April 7, 2019 at Euclid Hospital. He was born May 28, 1918 in Cleveland. Jim grew up in South Euclid. He graduated from Cathedral Latin High School in 1936 and John Carroll University in 1940. He was proud to be the oldest living alumni from both schools. He was a World War II Army Veteran serving in Italy and Africa and earned a Bronze Star. He was employed in the Appellate Division for the Internal Revenue Service and retired at age 56. He traveled the United States and Europe with his wife Jane. He was a long time parishioner at Ss. Robert and William Parish where he was in charge of Catholic Charities. He was also a lector and Eucharist Minister. He lived in Euclid until moving to The Waterford in Richmond Hts. five years ago. Jim was the beloved husband of the late Laura Jane; dear father of James F. Jr., John C. (Maria) and Robert A.; father in law of Patricia Sullivan; grandfather of Robert Jr., Anne (Adam) Ference, Michelle (Justin) Niemec, Laura, Anthony and Daniel; great grandfather of Anthony, Layla, Owen and Nolan; brother of Mary Rita (James) Fleming (both deceased) and Helen Knespler; uncle and great uncle of many. A Mass of Christian Burial will be held on Saturday April 13 at 10:30 AM at Ss. Robert and William Parish, 367 E. 260 St. in Euclid. The family will receive friends from 2-4 and 6-8 PM on Friday at Brickman Bros. Funeral Home, 37433 Euclid Ave., in Willoughby. Contributions to Ss. Robert and William Parish would be appreciated. "Email Address" would like to share the life celebration of JAMES F. SCHLECHT. Click on the "link" to go to share a favorite memory or leave a condolence message for the family.